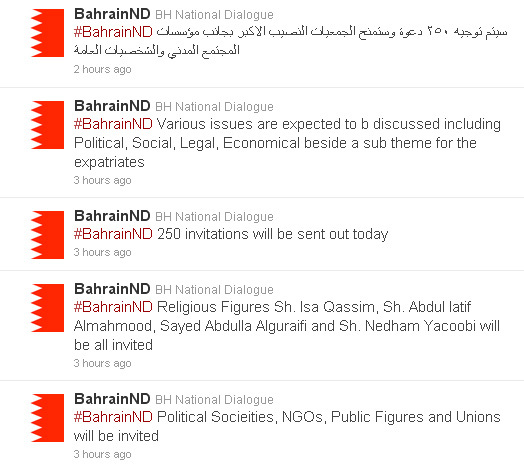 In the past week more news has been trickling in about Bahrain's al-Dhaharani-led National Dialogue, not least via the new Twitter account setup by the government to disseminate propaganda--er, I mean news--about the initiative set to begin on July 1. As indicated by such tweets as these, then, the most notable new development seems to be that the authorities have altogether disregarded al-Wifaq's argument (via Khalil al-Marzuq) that "[t]he dialogue that needs to happen is between the King, the Crown Prince, and the opposition." Instead, it appears to be taking the exact opposite route, designing the national dialogue to include as many people as humanly possible in order, one assumes, to preclude any chance of agreement on substantive reforms. Sh. Fawaz has already indicated that the dialogue "will include 60 societies." No word whether the BSPCA in Saar has been invited. In fact, I myself am thinking of registering the Justin Gengler Society for the Promotion of Virtue and Prevention of Vice so that I can finally visit al-Safriyyah Palace. More likely, though, given the lack of enthusiasm on the part of Bahrain's authorities, the national dialogue meetings will be held at Nando's in 'Adliyah. We have offered so many sacrifices and cannot back down and end up empty handed. As always, we will post the video of the sermon once it's been posted to YouTube, which shouldn't be long. This is all the more so given the concerted media campaign lately designed to highlight American favoritism toward the Bahraini opposition. Indeed, the pro-government Twitter camp is quick these days to report any sightings of U.S. Embassy officials meeting with the opposition. This guy, for example, says: "I always see [former al-Wifaq MP] Jasim Hussein with Americans... everywhere he is meeting with them in coffee shops. Coffee is the biggest ... link between foreigners and al-Wifaq." And another asks provocatively: "I wonder why Munira Fakhro from Wa'ad is meeting with the chargé d'affaires from the American Embassy in Lulu's [coffee shop] a little bit ago?" So, again: what happens when July 1 comes around and al-Wifaq is not at Nando's with the other 731 societies talking dialogue? And equally interesting is the opposite scenario: what happens if al-Wifaq is somehow convinced to take part? When one visits Bahrain's main opposition forum one is greeted with the following banner, declaring, alternatively, "No Dialogue with Murderers"; "Fall, Hamad! Fall, Hamad! "; and "Self-Defense is a Sacred Right." Certainly, not everyone in the opposition will agree with such sentiments, and not all of the forum-goers are al-Wifaq supporters to begin with, but, as Toby Jones has observed recently, "Events seem to have gone too far and too fast for some kind of quick fix through talks." Time will tell. Finally, we may mention a notable event that does not fit neatly in the preceding: the news that King Hamad's son Nasr (of "Bahrain is an island with no escape passage; everybody who interfered in these issues will be punished and everybody who took a stand [supporting the regime] will be awarded" fame) has been promoted to Head of the Royal Guard, a decision he announced himself via Twitter. At the same time that Crown Prince Salman's stock is falling, then, Sh. Nasr's seems to be rising. As if Al Khalifa court politics needs any more complications. Updates: some highlights of 'Ali Salman's address today in Sitra have already been posted. I'm sure the video is not too far off. And there are Twitter reports of a march tomorrow on the Prime Minister's Palace. Update 2: an astute reader points out this al-'Arabiyyah article reporting that non-Bahraini ex-pats will also be invited to the national dialogue! Hell, why not? The chances of the Justin Gengler Society for the Promotion of Virtue and Prevention of Vice are looking up! Indeed, it would seem that the only group not welcome to al-Dhaharani's dialogue are, based on remarks he made just last year in May 2010, Bahraini women. Al-Dhaharani said then, "We have to look at our society in a realistic way and I don't believe that it is ready for women in politics." But ex-pats in politics? No problem. Update 5: The President of al-Wifaq's Local Council for the Northern Governorate, 'Ali al-Jabal, has released a series of questions/concerns regarding the national dialogue, titled "Dialogue of the Deaf." You might guess what his position is. 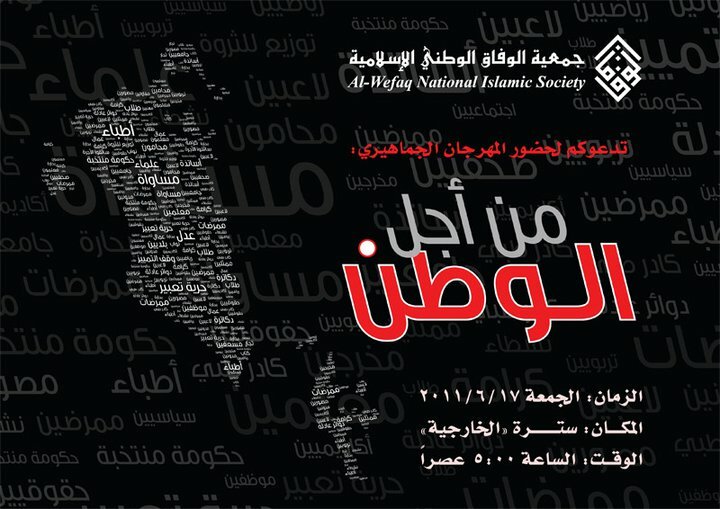 Meanwhile, in a development the likes of which we've seen a few times before, the leftist political society Wa'ad has been unbanned and will participate in the national dialogue after releasing a statement (full text here) distancing itself from the opposition as well as an impending change in administration. Yet another organizational coup (a la Al-Wasat) for the Bahraini government. Good article justin. Its a shame you don't speak arabic. Thousands of pro-democracy Bahraini youth turned to Paltalk to exchange their tactics and invite opposition figures regularly. Eventually the bahraini gov. hit back and blocked it. Now its only hundreds. according to a press release on http://www.alarabiya.net/articles/2011/06/17/153664.html expats were also invited to the "national" dialog, "because they represent around 50% of citizens". they are more than 50% actually. maybe they should get half of the 250 invitations. 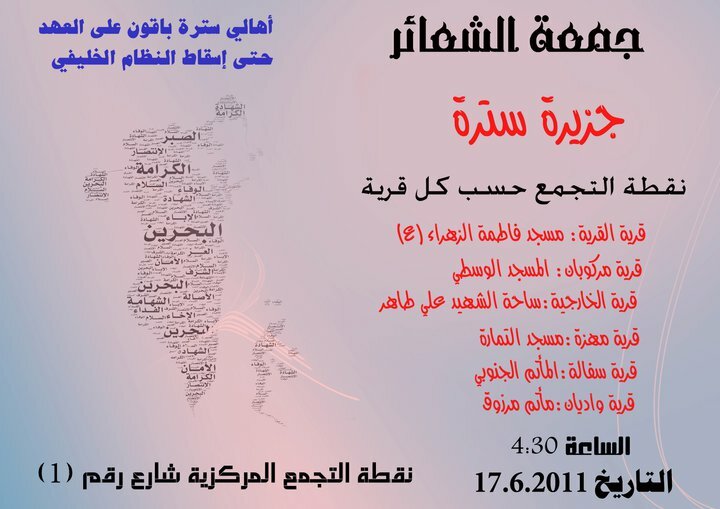 it's not clear if Lebanese, Iraqis and Iranians expats are invited. but very clear govt ability to recognize 50% expats community is better than ability to recogniz majority shia of original citizen. Great. Maybe the Justin Gengler Society for the Promotion of Virtue and Prevention of Vice has a better shot than we thought! As a Bahraini, all I can say is: things don't look too bright for us right now.. Many parties are looking for political (and perhaps also monetary?) gain and the ordinary citizens who have been suffering for merely demanding their basic rights will continue to pay the price.. May God help us! Justin, I assume that you are a citizen of the United States. In your country, expats, migrant workers, immigrants, call them what you will, can apply for citizenship once they have been legally resident for 5 years. Children born in the US are automatically US citizens. In Bahrain, the nationality laws are rather more restrictive. Perhaps rightly so given that Bahrain is a very small country. Nevertheless the expats who make up more than half Bahrain's population should not be so lightly disregarded. They are doctors, engineers and teachers. They build cheap houses for Bahrainis in the blistering sun, they clean up after them, drive around their children. They cook, wait at table and rear their children. Usually for very little pay. Don't you think it's slightly undemocratic to seek to deny them a voice at the national dialogue? And that's naturally practised even in small-scale when a new member comes into a group, their opinions are as valued as the older members of said group. Even us long-time citizens don't have that right, so.... yeah, it's just a PR stunt, besmirch your opponents while looking good to the rest of the world. Like you said the ones with citizenship can play a role the ones with no citizenship should not. Thats how it is all over the world. The point is not that ex-pats should be "lightly regarded" or are not hard workers. (Although, to the extent that they are not able to vote in Bahrain or even switch jobs without the consent of their employer, how highly regarded or respected can they be within the Bahraini political system?) The point, instead, is that the political conflict that exists in Bahrain exists between the Bahraini government and those who oppose it. When Hamas and Fatah attempted a political reconciliation a few months ago, did they invite Islamic Jihad, foreign aid workers, and 60 other groups from within Palestine? And, thinking back to the only real reform project that Bahrain has seen since the early 20th century--the National Action Charter initiative in 2001/2?--how many foreigners took part then? Weren't they "respected" and "highly regarded"? Even now, that foreigners or any other group are invited to the national dialogue is not because they are somehow "respected" but because they play the useful role of diluting the process with yet more voices, making any actual agreement that much less likely. Finally, the inclusion of non-Bahrainis is laughable when you consider the actual demands made by al-Wifaq (or that it should make): electoral redistricting, an end to police/military exclusion, and to political naturalization. Notice that NONE of these ideas have anything to do with ex-pats, as they can't vote, they can't serve in the military/police, and do not tend to be naturalized (that's what Yemenis and Baluchis are for). So what exactly are they going to contribute? I don't think the national dialogue is just about reconciliation. It is about social, political and economic change which presumably will entail changes to the Bahraini constitution. For a political scientist to argue that only one political party - Al Wefac - should take part in the discussions strikes me as bizarre. Similarly I would have thought that the question of exactly who is entitled to apply for citizenship and to vote in parliamentary elections is one on which established expat communities in Bahrain have every right to contribute. My point is not that al-Wifaq should or will be the only party involved. My point is that the dialogue initiative was sparked by a specific set of events, namely a revolt by a largely-Shi'a (and secular Sunni) constituency with long-standing political demands. This constituency is not asking for a repeal of LMRA or for better schools but for specific revisions to the political status quo. The idea that the government will take the opportunity to embark on sweeping "social, political, and economic change" I think is naive. The government would like to frame the dialogue as a mere continuation of a decades-long modernization project that may or may not coincide with the largest mass uprising since the 1990s. If a group of students -- say, females -- is upset with a professor because they claim he never calls on them in class, favors male students, and gives them undeservedly-low grades on their papers, does it make more sense to the teacher to amass all the students to decide on an entirely new curriculum, or to call in the female students and discuss their complaints? The political landscape in Bahrain has been changed dramatically by the events of the last few months. It's no longer a case of just one group having a specific set of grievances. The 'silent majority' has been mobilised by by the violence and intimidation that took place during the later stages of the protests and they are no longer willing to sit back and let others decide their future. At this stage, if major conflict is to be avoided, it is necessary to examine reforms that will satisfy everyone, not just those who shout the loudest. Fine. But if this is your position how can you believe that an initiative led by an unpopular and partisan patron with no direct link to the ruling family and thus no real power to enact change is a project that has any chance of bringing "reforms that will satisfy everyone?" Media Jihad: If Ya Can't Beat 'Em, Sue 'Em! Why Does America Hate Sunnis?